I try to compile a document as pdf/x and pdf/a with pdfx under LuaLaTeX, and I am already quite successful. 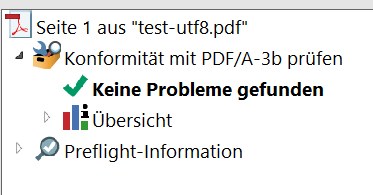 One thing still poses problems though: With some fonts I get the following error if I check the resulting pdf/a file with Acrobat: "CIDset in subset font is incomplete (font contains glyphs that are not listed)" (VeraPDF gives the same error, so the issue seems to be real). I realise that not everyone will be able to compile this MWE due to the proprietary font, but since the problem only occurs with specific fonts, I had to use this example. The pdfx manual mentions this error, but only in relation to XeLaTeX. According to the manual, it should not occur with LuaLaTeX. From what I understand, this seems to be at least to some degree a problem of this specific font, but since I am relying on it, I am looking for a way to fix it. Here's a new MWE with a bunch of fonts which are hopefully more common (the paths have to be adapted of course). All these fonts give me the same error. I wonder if this only happens with .ttf OpenType fonts. Not the answer you're looking for? Browse other questions tagged luatex pdf pdf-a pdfx or ask your own question. Is there a “new” canonical test for fonts and languages?